MetaEdit+ can be embedded as part of your product through our partnering program. In addition to supporting your own modeling languages and generators, the user interface can be customized to show your branding and integrate with the rest of your product. When MetaEdit+ is embedded into your product it can use your splash screen when started and show your program icon. 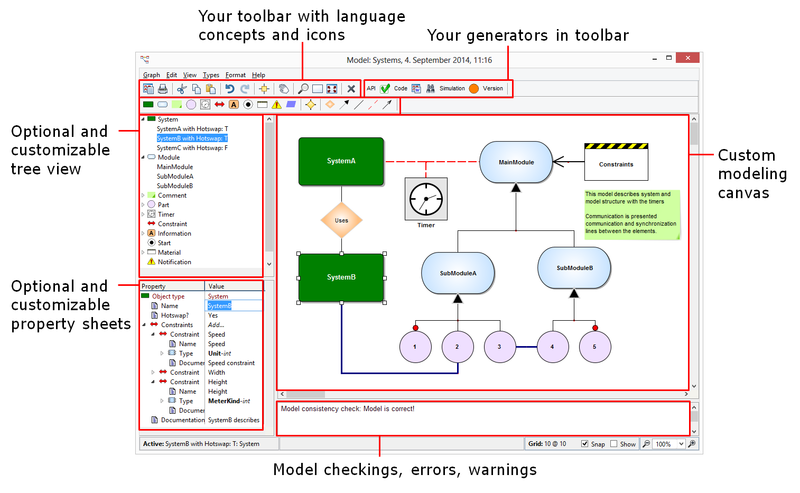 You can hide parts of the user interface leaving only selected tools like the Diagram Editor visible to your users, with the functions of the launcher and browsers being handled by your own product (cf. the Eclipse plugin and Visual Studio extension). The parts of your product can communicate and transfer information via the API, XML, files, and hyperlinks. You can also integrate with any license management software your product may use. 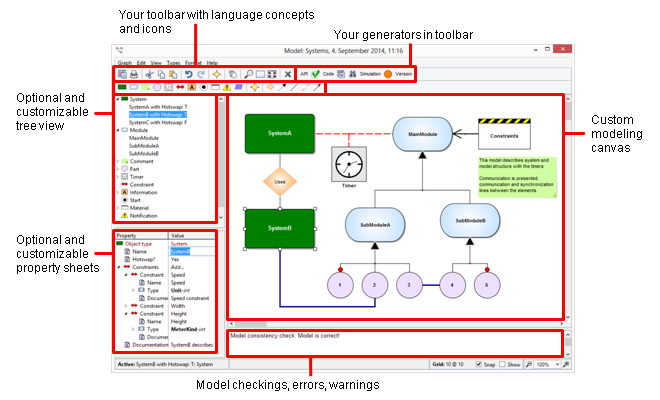 MetaCase provides support for tool integration, including development of modeling languages and generators. Via our partner program we can also provide support services for the MetaEdit+ part of your product offering. We have experience on embedding MetaEdit+ functionality with other products covering various areas of modeling, such as early phase analysis, software development, configuration deployment, and testing. Public examples on tool integration are available covering typical programming environments such as Microsoft Visual Studio and Eclipse.